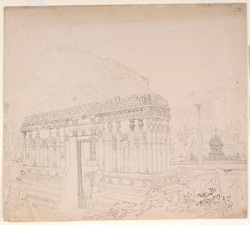 Pen-and-ink drawing by Philip Meadows Taylor of Nandi Drug and the gate of the Temple of Nandi, dated March 1834. Inscribed on back in ink and dated as above. Taylor was stationed at Hingoli from December 1832 to October 1834. In March '34 he paid a visit to the Nilgiri Hills and this sketch, together with WD118-119, was probably made during his journey there. The rock fort of Nandi, 50 kilometres north of Bangalore, is situated atop a granite hill rising about 600 metres above the plain. In the 18th century it was a favourite retreat of Tipu Sultan who was captured by the British there in 1791. The monuments on the top of the hill and in the village below are assigned to the 9th century. The Bhoganandishvara Temple is situated at the foot of the hill and consists of a pair of shrines dedicated to Bhoganandishvara and Arunachaleshvara. It is built in the massive style typical of the 9th-10th century Nolamba rulers of Hemavati and was later enlarged in the 16th century during the Vijayanagara period. This drawing depicts the unfinished Vijayanagara through which the temple is entered on the east. A second gateway leads to a colonnaded enclosure with a columned hall with intricately carved piers from the Vijayanagara period. The two shrines have pilastered walls and pierced windows adorned with carved figures. They are roofed with multi-storey pyramidal towers. The interiors have carved columns. A smaller shrine dedicated to Uma Maheshvara was added in the 17th century under the Gowdas between the existing sanctuaries. It is approached through a Vijayanagara pavilion with intricately carved basalt columns, brackets and ceilings.